Aslaug has lived a very isolated life in the wilds of Maine, raised and heavily controlled by her mother. When Mother dies, Aslaug is set adrift but finds the aunt and cousins that she never knew she had. But if life with Mother was a bit odd, her new family is even stranger and things quickly descend into madness. Told in flashback (and in the present through courtroom testimony), we gradually piece together what has happened. 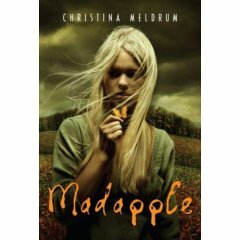 A richly textured book with exotic characters, Madapple is densely written and a bit hard to get through. After 50 or so pages, I began to get comfortable with the style and really enjoy the book, but at midpoint the writing descends into some dry religious history and starts to lecture. Apparently Meldrum became really interested in early Christian thought and wanted to share. There is a point to this (it has some bearing on the plot) but she goes way overboard and I lost interest quickly. The ending is a bit convenient (relying upon that weaker courtroom drama device of the surprise witness). Overall an original and provocative book but it gets a mixed review from me.